A collection of various aryl-aryl homo and cross-coupling reactions, in particular featuring Pd-catalyzed major named cross coupling transformations: Kumada, Negishi, Stille, Suzuki, and Hiyama. Thank you Siva! I appreciate it. Share your thoughts and ideas – would love to make more! thanks for your fabulous Info Graphics. I like them very much! 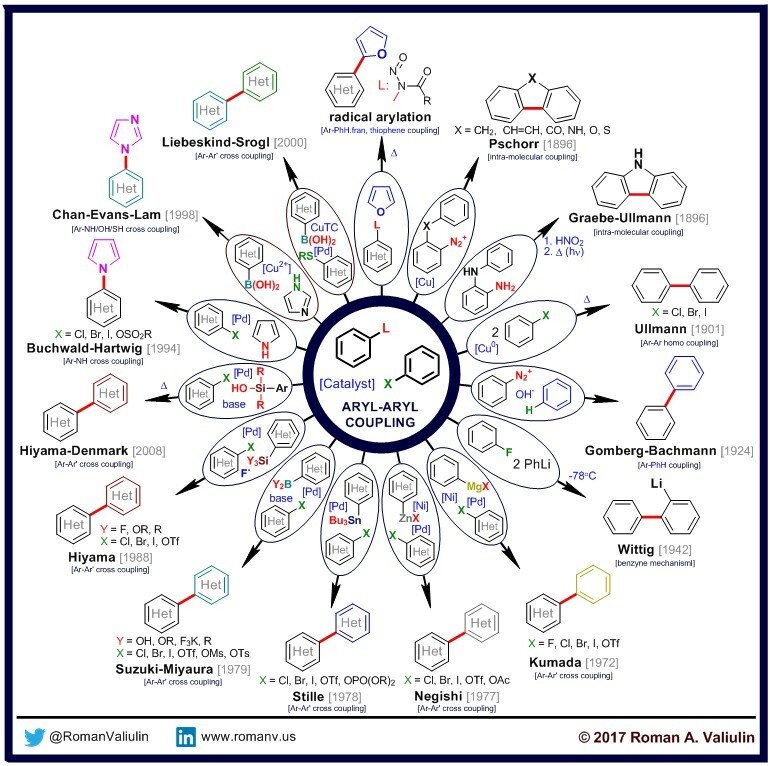 In this Aryl-Aryl ChemInfoGraphic I wounder if an Aryl-Aryl coupling is the outcome of an Liebeskind-Srogl reaction. Dont you get an Ketone? Also your Liebeskind-Srogl Infographic in your “100 Mechanism to know” section depicts it as an Ketone Synthesis. Or is it also possible to get an Aryl-Aryl coupling under certain reaction conditions? Thank you for the comment. I am glad you enjoy them. As far as I could gather from the literature you can get either a ketone or an Ar-Ar product. If you start with a thioether (Ar-SR —> you get an Ar-Ar product), but if you chose a thio-ester (R-C(=O)SR’ —> it goes to a ketone R-C(=O)R’). In either cases you should break your weak C-S bond.